Beyond providing data for all 32 NFL teams, PFF also supports network broadcasters with game-preview packets that are used to enhance the in-game experience for fans and viewers. This Seahawks-Raiders preview features the same information our broadcast partners use for team research and in-game production. 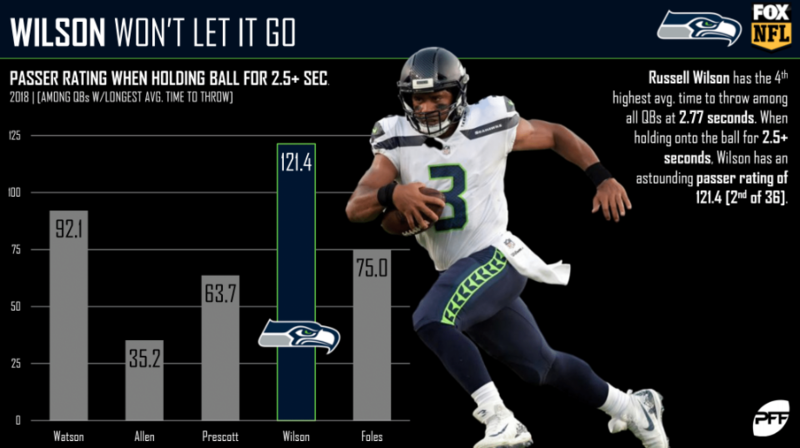 Since entering the league, Russell Wilson has averaged at least 2.50 seconds to throw every year of his career and his average of 2.77 seconds this season ranks third-highest among quarterbacks. 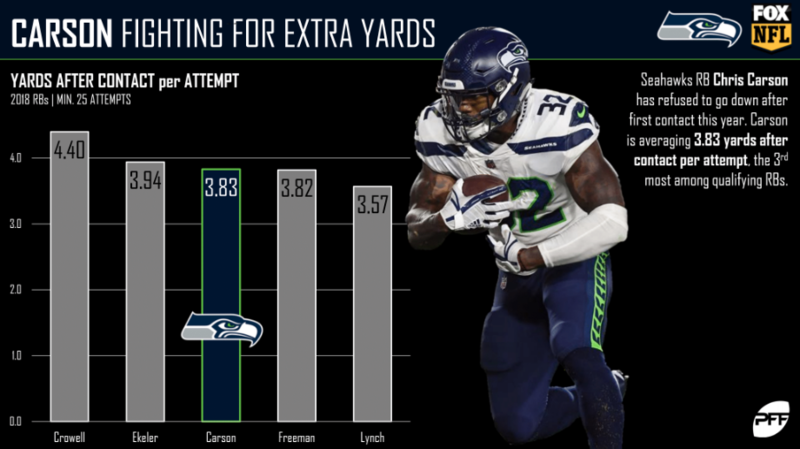 Chris Carson has proved that he’s capable of being the lead back in Seattle’s committee. He has earned 3.83 yards after contact per attempt this year, which is the third-best mark among running backs. 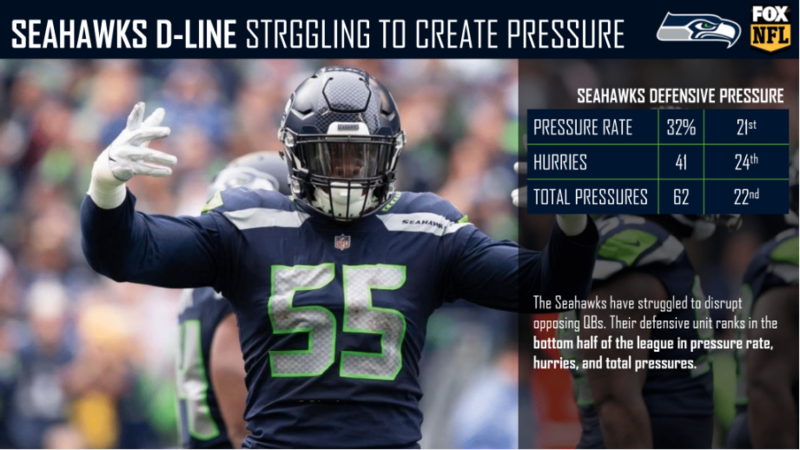 The Seahawks defense has been a force to be reckoned with for years, but the pass-rush has struggled this year, earning the 30th-highest grade (58.0) in 2018. The team’s 62 total pressures this season ranks 22nd in the NFL. 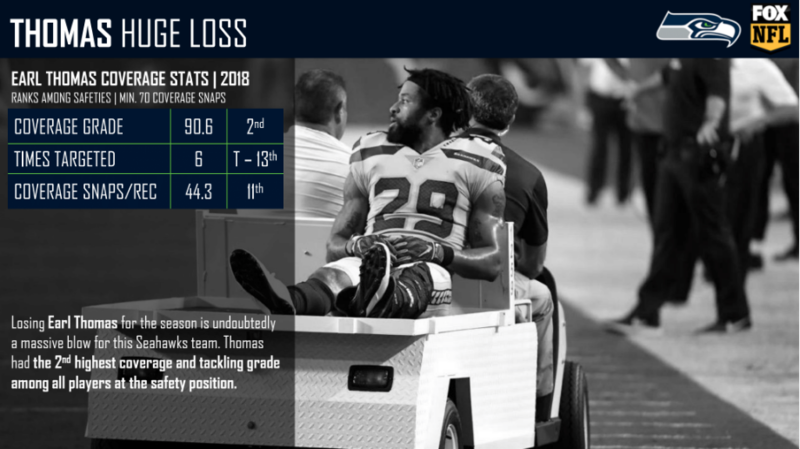 With Earl Thomas’ season-ending injury, the Seahawks will lose the final remaining player from the vaunted Legion of Boom secondary. His 91.6 grade in 2018 is the highest of his career, while his 90.6 coverage grade ranked second-highest among safeties. Thomas’ presence in the middle of the field will be missed. 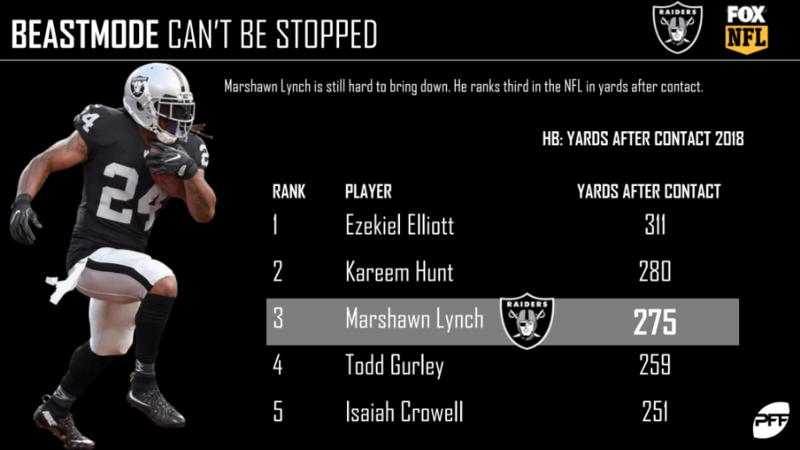 In his 11th season, Marshawn Lynch has continued to make tacklers pay for trying to bring him down. The skittle-powered Beast Mode has earned 275 yards after contact this season, accounting for 83.1 percent of his total rushing yards. He’s also forced a whopping 21 missed tackles this season, the second-most in the league. 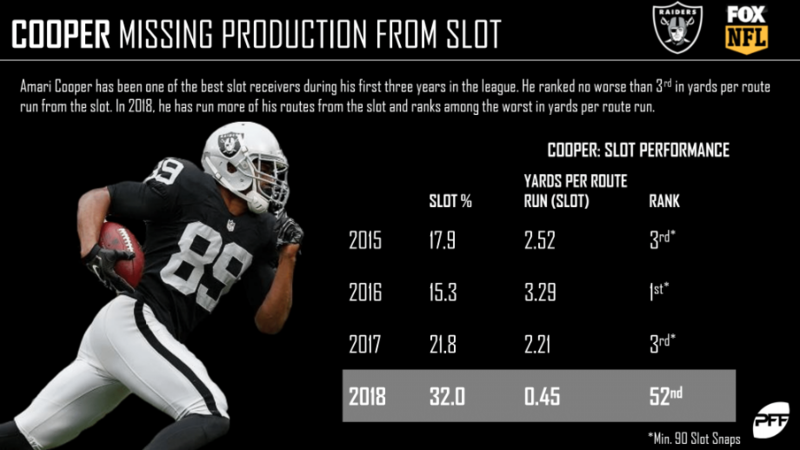 Amari Cooper is spending more time in the slot than ever before, but he hasn’t been anywhere near as efficient as he has been in recent years. After the blockbuster trade of Khalil Mack to the Bears, the Raiders have struggled to get pressure on opposing quarterbacks. 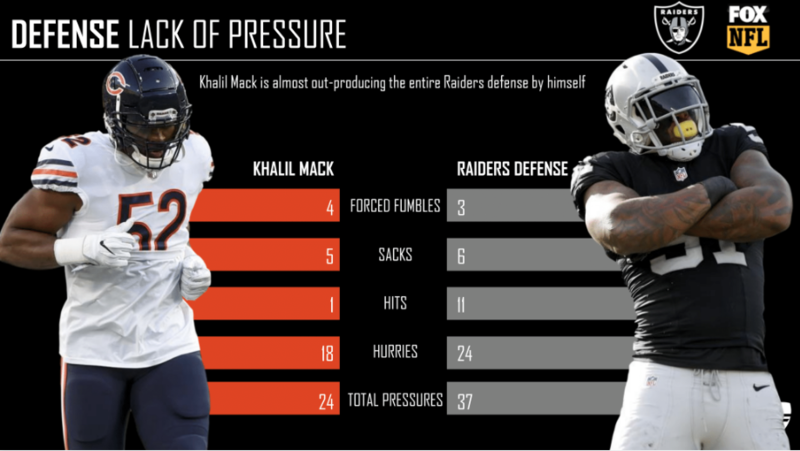 Mack has nearly equaled the entire Raiders defense in sacks and total pressures. 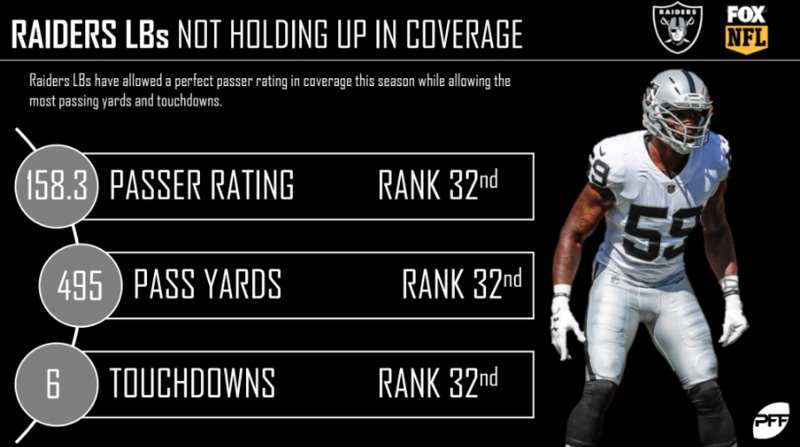 The Raiders linebacking corps has had some difficulty in coverage this season. The position group has combined to allow 495 passing yards and six touchdowns to opposing pass-catchers, resulting in a perfect passer rating of 158.3. 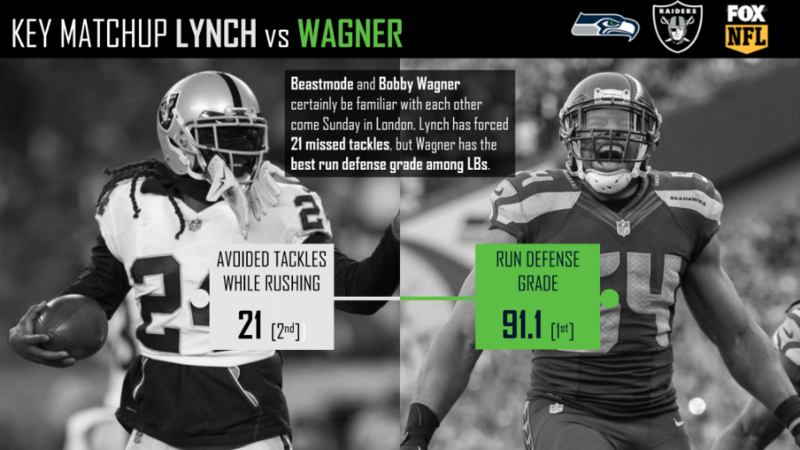 PFF Greenline has projections for the spread, moneyline and over/under of the Seahawks’ matchup with the Raiders. Get its picks here.